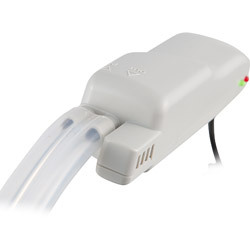 The formaldehyde data logger is able to measure and store the concentration of formaldehyde in the environment. The construction of the formaldehyde data logger makes it a mobile device. In addition to that the formaldehyde data logger has threads so that it can be placed on a tripod to allow long-term measurements. These threads are tapped on the main unit and the probe. When the formaldehyde data logger is switched on, it performs a self-calibration to ensure correct measurement results and the correctness of the instrument itself. After that self-calibration, measurements can be taken. During those measurements the formaldehyde data logger measures the concentration of formaldehyde (HCHO) as well as the temperature (in °C or °F) and the relative humidity. 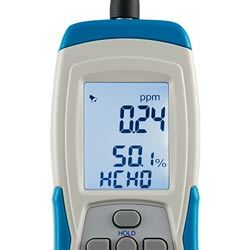 The formaldehyde data logger possesses different measurement functions. These functions include a HOLD-function as well as a MAX- and MIN-function. After the measurements have been made and the values are stored, you can easily transfer them to a computer in order to analyze them. The corresponding software is included in the delivery. In case that you should have more questions regarding the formaldehyde data logger PCE-FHM 10, please read the following technical data, use our contact form or call us: UK customers +44(0) 23 809 870 30 / US customers +1-410-387-7703. Our technicians and engineers will gladly advise you regarding the formaldehyde data logger or all other products in the field of Control Systems, Laboratory Equipment, Measuring Instruments or Scales and Balances of PCE Instruments Ltd.
Formaldehyd is a colourless, acrid odour, substance which is gaseous at room temperature. When it is used impropperly, it may be cause allergies and irritations of skin, eyes or respiratory tracts. It is classified as a carciogenic substance. In addition to clothing, formaldehyde also escapes from wooden composites (furniture and chipboards) and floor coverings. 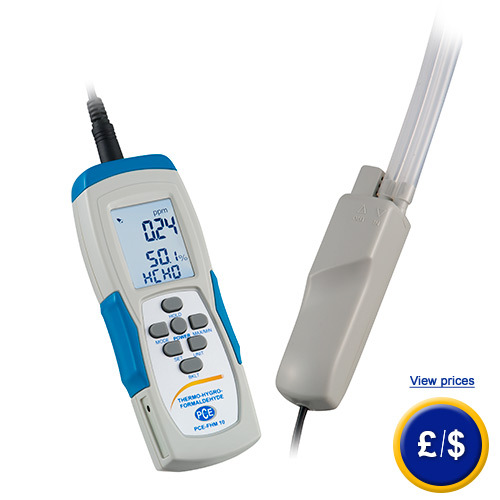 The formaldehyde data logger offers clear readings of measurement values on the LCD. A reason for this is the backlight and the size of the LCD. A fan has been installed within the probe of the formaldehyde data logger. This makes a submission and admission of the air possible.